This is a perfect fall stew, filled with vegetables from the late summer garden and richly spiced with cinnamon, cayenne and turmeric. It’s based off a recipe from Moosewood Restaurant, so I can’t take credit for the brilliant idea, but when I made it for the cooking demo at the Redwood Valley Farmers Market this past Sunday, I realized I’d made so many small changes to it so it would fit what we have locally available that I should probably write up a fresh version so I don’t have to explain it to anyone else. Because it’s so good! You must make it. If you want a simple, cheap, delicious dinner using a bunch of stuff you probably have around anyway, this is it. The original recipe is from Moosewood Restaurant Favorites, which is a fantastic cookbook and worth every penny. In a large pot, heat the olive oil on medium low heat. Add the onions and salt and cook, covered, for five minutes. Add the garlic and spices and sauté, covered, for another three minutes. Add the winter squash and sauté for a couple more minutes, then pour in the water. Add the tomatoes and eggplant, cover and let everything simmer for ten minutes, stirring occasionally to prevent sticking. 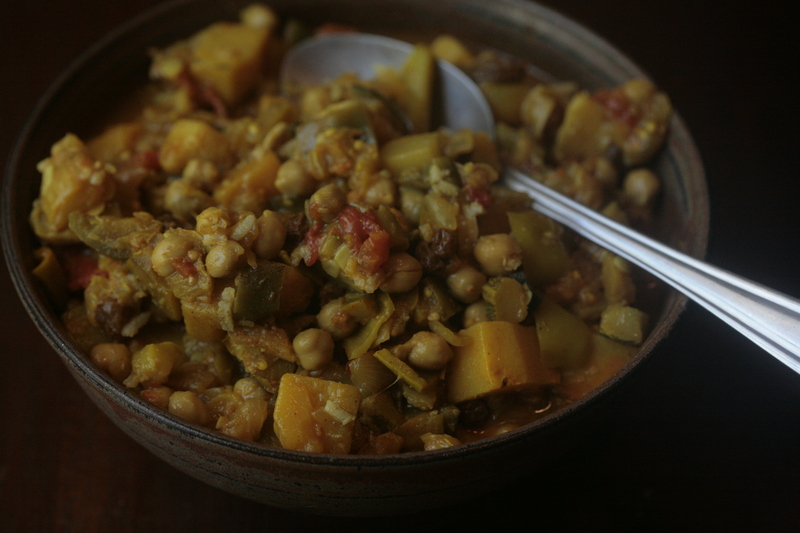 Add the peppers, summer squash, chickpeas, raisins and apples, cover, and simmer for another fifteen minutes, or until the winter squash and eggplant are tender. Taste and season with salt and pepper as needed. Garnish with lemon wedges. Feel free to change around the fruit based on what you have available. This stew would be great with dried apricots instead of raisins and I’d love to try it with chopped fresh pears instead of the apples.